Craft beer Pioneer Sam Koch and The Boston Beer Company/Samuel Adams are pleased to announce the release of 2015 Utopias. I first tasted Utopias back in 2013 at a special tasting of the 10th Anniversary edition at Super Deli Mart in West Seattle. The richness, complexity and Cognac-like qualities of this unique beer blew me away. I haven’t tasted any Utopias since, but I’d love to get my hands on a bottle of the 2015 if I can. This year’s version comes in at an incredible 28% ABV. A limited number of bottles should start appearing in the Seattle area as soon as next week. BOSTON, November 10, 2015–The brewers at Samuel Adams today announced the limited release of highly-coveted Samuel Adams Utopias, a beer unlike any other. Only the ninth batch brewed since the first release in 2002, this year’s Utopias, like previous vintages, was brewed in small batches using traditional methods, blended with previous vintages going as far back as 1992, then finished in the Barrel Room at the Samuel Adams Boston Brewery. For beer fanatics, Samuel Adams Utopias has become one of the most sought-after beers on earth. Meant to be savored like a fine cognac or port, Utopias is a rich, uncarbonated extreme beer known for its extraordinary flavor profile. Utopias has aromas of wood, toffee, cocoa, raisin and maple, which hint at its distinctive flavors, which range from hints of molasses, earthy wood, dates, and light smoke to nuts and toffee. With each new batch of Utopias, the brewers at Sam Adams push for a complex flavor profile, and during this process have created brews with alcohol levels reaching over 30% ABV; this year’s beer is 28% ABV and is best enjoyed as a two ounce pour in a snifter glass at room temperature. While some of the barrels have reached over 30% alcohol, the brewers blend down because the goal is to craft complex flavors, not an extreme alcohol percentage. For the 2015 Utopias, the Sam Adams brewers used a variety of malts for the brewing process and during fermentation used several strains of yeast, including one traditionally reserved for champagne. The beer was then blended with Utopias vintages from previous years including some that have been aging for more than 20 years in the Barrel Room. Aging the beer over a longer period of time accentuates the beer’s distinct vanilla notes and creates aromas of ginger and cinnamon. Some of this aged beer is over twenty years old, old enough to drink itself. Utopias is brewed using traditional methods. The brewers begin with a blend of two-row Caramel and Munich malts that imparts a rich, deep amber color. Noble hops – Hallertau Mittelfrueh, Spalt Spalter and Tettnang Tettnanger – are also added to lend complexity and balance. 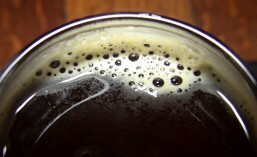 During fermentation, several yeast strains are used, including one normally reserved for champagne which the brewers call a “ninja yeast.” This fresh beer is then blended with a variety of different barrel-aged beers and “finished” in a variety of barrels to impart additional complexity and flavor. This release of Samuel Adams Utopias also uses a blend of beer finished in a variety of barrels. “Finishing” is a creative way for the brewers to impart additional flavor from a variety of barrels before the beer is bottled. This final step of finishing the beer lasts several months before the beer is bottled and imparts flavors ranging from fruit like cherry and raisin to chocolate, leather and oak. The multi-step and lengthy process results in flavors reminiscent of a rich vintage Port, fine Cognac, or aged Sherry, while feeling surprisingly light on the palate. New this year, the brewers used White Carcavelos wine barrels to finish the beer, in addition to barrels that once housed cognac, Armagnac, ruby port, sweet Madeira, and Buffalo Trace Bourbon. White Carcavelos wine barrels help to amplify the dried fruit and oak flavors of this year’s Utopias. Carcavelos wines are blended and fortified like a port, are off dry and topaz colored with nutty aromas and flavors. Carcavelos comes from a small region of Portugal and the barrels are very rare, which made the Sam Adams brewers all the more excited to experiment with them as finishing barrels. Samuel Adams is teaming up with Ted’s Cigars to release limited-edition Utopias-seasoned cigars, flavored with the 2015 batch of Utopias. Ted’s Cigars uses their proprietary process of aromatic seasoning to create a cigar unlike any other. The Utopias-infused cigar features a distinct subtle sweetness, and notes of maple and vanilla from the brew, as well as a spicy complexity from the tobacco blend. This extreme beer brings out a creamy, spicy sweetness from the cigar and enhances the subtle leather and smoky character in the cigar’s finish. Hand-rolled in the Dominican Republic, the cigars make an unexpected stocking-stuffer and will be available on TedsCigars.com through the end of December. Pair the cigars with Samuel Adams Utopias for the ultimate holiday treat. I’ll keep my ears open and update this post with information I find on any local tasting events for 2015 Utopias – or any local bottle shops where you might be able to procure yourself an entire bottle. If you’ve never tasted Utopias before, I urge you to find a tasting event and find out for yourself what all the fuss is about – because this is one beer that is definitely worth fussing over. It seems that the majority of Utopias in Washington is at Costco locations. I found myself a bottle last night at the Costco in Issqauah. They still had at least 13 more bottles (I counted the claim slips) after I picked one up. I suggest you call your local Costco first before making the trip. They should be able to tell you if they have any in stock. Their price is $169.99 + Tax. This entry was posted in Beer, Beer Ingredients, Beer Release, Blending, Bottle Shops, Brewing, Cigars, Imperial, Limited Edition, Rare, Seasonals, Tasting and tagged 2015, beer, Beer Release, Boston, Boston Beer Company, November, Samuel Adams, seasonal, Utopias. Bookmark the permalink.